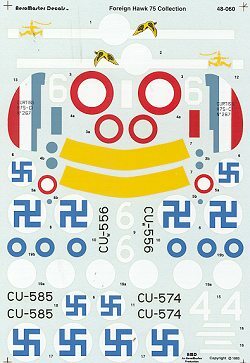 For those of you who like the Hobbycraft P-36 kit, here is a sheet for the foreign ones. Actually, that should be for Finnish and French Hawk 75s. The majority of them are for the Finnish versions. If you have the ancient AMT kit, I suppose it could be used on that kit as well, but few will build it with the much better Hobbycraft option. First aircraft is a French Hawk 75 of GC 1/5 in Morocco in the summer of 1941. It carries the Vichy stripe on the fuselage that was in use before the requirement to paint the red/yellow cowling and tail surfaces. Aeromaster has provided little bits of red, white and blue to make sure that the rudder stripes cover. 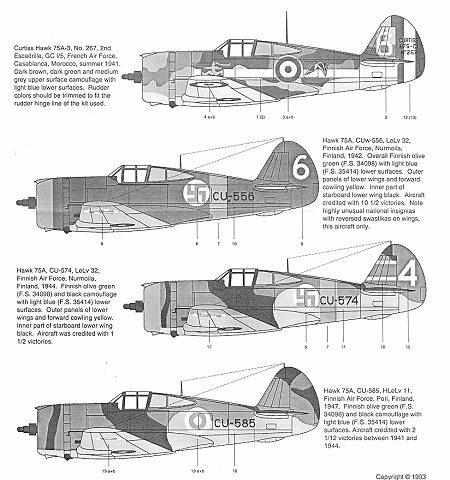 The next three are Finnish and in various camo and insignia variations. First is white 6 in Olive Green upper surfaces with Light Blue undersides. The usual Eastern Front markings are on this plane in form of a yellow fuselage band, underside of wing tips and cowling. This particular plane was flown by ace Aulis Bremer. He scored 2 1/2 kills with this plane in early 1942, shooting down two I-16s and sharing an I-153 while assigned to LeLv 32. The swastikas on the wings have been painted on in reverse. Photo on page 109 of reference. Next is white 4 in standard Finnish camo of Olive Green and Black uppers with light blue undersides. It also has Eastern Front markings. This aircraft was also assigned to LeLv 32. Unusually, the inner panel of the starboard lower wing is painted black. Finally is CU-585 in standard camo scheme, but in post war markings and without the wartime yellow markings. This plane is pictured as it was in 1947. If you would like your product reviewed fairly and quickly by a site that has well over 150,000 visitors a month, please contact me or see other details in the Note to Contributors.